UNESCO marks 2019 as the 150th anniversary of the periodic table, a carefully considered layout of every known chemical element based on trends in atomic number and chemical reactivity. Peer into any laboratory or science classroom and you will see the unmistakable design of the table. An icon of science, it has become indispensable in understanding physical and chemical research. The story of the modern periodic table begins with Dmitri Mendeleev in 1869, but iterations of it litter the years approaching and following Mendeleev’s first inception. Upwards of 700 alternate depictions have since been published, developed to display different observed trends of chemical and physical properties. Despite 150 years of intricate study, there still remains some ambiguity in the placement of heavier elements. The recognition of Mendeleev’s work during his time came from some clever considerations he made. He first sought to list all known elements at the time by their weight and valency, a term to describe the number of times an atom tends to bond to other atoms. His ordering of the elements allowed him to predict the existence of undiscovered elements and their properties from gaps he purposefully kept in his table. Whilst ordering elements by their atomic weight, he was able to predict the existence of gallium and germanium. Later work by Ernest Rutherford and Henry Moseley showed that the sequential placement of elements in a row also corresponded to increasing nuclear charge, or the number of protons. The acknowledgement of subatomic particles meant many more elements could be proposed and predicted before they were synthesised. There is an incredible depth to the periodic table. Cast your mind back to your first lessons in chemistry and you will be reminded of protons, neutrons, and electrons. Later on, you might have learned about ionic, covalent, and metallic bonding. Even more reading delves into trends observed down any column or row, and that you can generally predict how an atom will react based on the row and column in which it is placed. For the masochists reading this, a higher level understanding of it provided by a degree in chemistry will communicate the quantum mechanical origins of electrons and their spatial arrangements around an atom. Miraculously, this information is all summarised into one table. 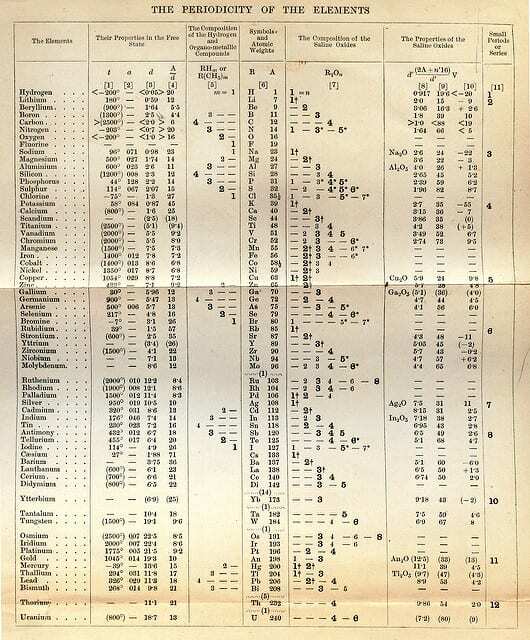 After Mendeleev’s first publication of his table, many other academics had their own attempt at experimenting with alternate designs. Just a year after, Heinrich Baumhauer came up with a spiral layout with hydrogen, the lightest element, right at the centre. His spiral also left intentional gaps for undiscovered elements. This likely failed to catch on because it could not compete with the simplicity of Mendeleev’s work. However, this did not stop even further experimentation by Theodor Benfey in 1964, producing one of the weirder and wonderful imaginings of the elements. Even after 150 years, there is still hot debate on the placement of certain elements. Hydrogen is tricky since it exhibits properties of both metallic and non-metallic properties. Heavier atoms in the lanthanide and actinide groups are difficult to classify into the correct columns since electron shells become extremely diffuse. With new elements being regularly discovered, it is entirely possible the design of the table could change to fit the properties of these new elements.